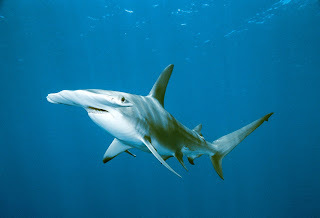 True Wild Life | Hammerhead Shark | Hammerhead Sharks are appropriately named after their flat shaped heads. 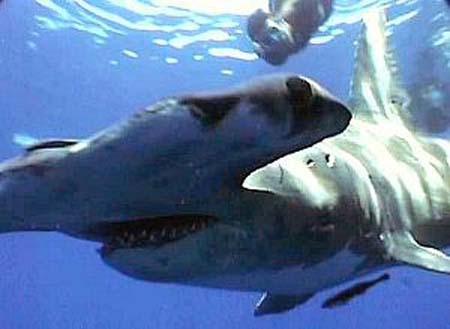 Hammerhead sharks are large carnivorous fish that prey on large fish and occasionally hammerhead sharks will hunt small water mammals. Hammerhead sharks are found in the warmer waters of oceans worldwide but hammerhead sharks are particularly found in coastal waters, and along continental shelves. 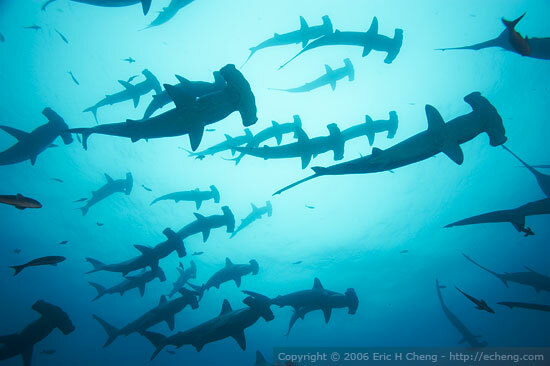 The shallow waters that the hammerhead sharks inhabit allow the hammerhead shark to hunt prey more easily. There are 9 different species of hammerhead shark worldwide, ranging from 3ft to 20ft in length! Hammerhead sharks are not commonly known to attack humans but can be aggressive if a human came into contact with a hammerhead shark. The flat shaped head of the hammerhead shark is thought to allow the hammerhead shark to detect prey more easily, as it increases the hammerhead sharks sensitivity to sonar activity. Hammerhead sharks are thought to use sonar waves detection in a similar way to their five main senses, so its like the hammerhead shark has a sixth sense. 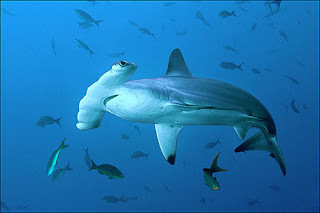 The shape of the head of the hammerhead shark is made up of two projections on either side of the face of the hammerhead shark, which gives the hammerhead shark the head shape that resembles a hammer almost rectangular in shape. The eyes and nostrils of the hammerhead shark are found at the ends of the hammer allowing the hammerhead shark to have better vision and smell of the surrounding water. Like many other species of shark the hammerhead shark is a solitary hunter during the night, but during the daytime hammerhead sharks are known to form schools of up to 100 hammerhead shark individuals. Hammerhead sharks are commonly seen in larger groups during the summer months when the hammerhead sharks are migrating together in search of cooler waters.